London & Scottish Property have reached practical completion on a significant reinstatement project of 23,000 sq. 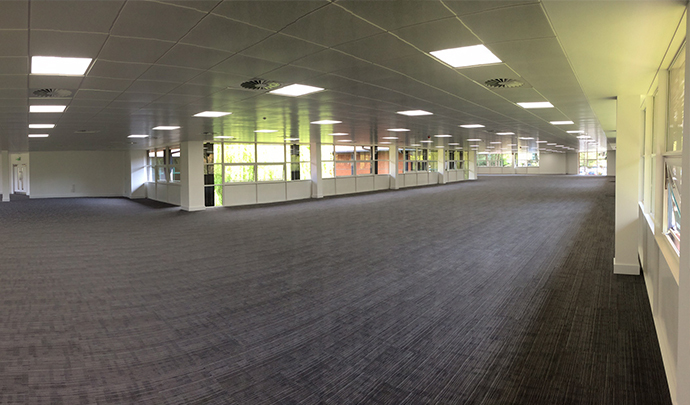 ft. at 2nd Floor, Hampshire House, Hampshire Corporate Park, Chandlers Ford. Further to former tenant Aviva vacating the space, the landlord (RR Wing) were required to reinstate the whole floor as no yielding works had been undertaken, further to lease expiry. Anticipating the landlord's need to reinstate the space, the Asset Manager had previously tendered the dilapidations package and were therefore able to start reinstatement works only 2 weeks after receiving keys back. With works underway and knowledge of the buoyant office market, the Asset Manager secured two agreements to lease prior to practical completion of works, fully tenanting the building within 4 months of Aviva's vacation.